Former Secretary of State Hillary Clinton testified before the 17-month-old House Select Committee on Benghazi for the first time. 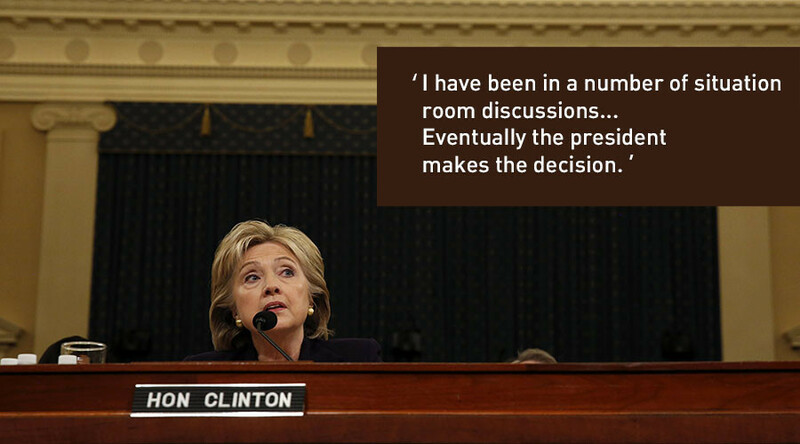 The daylong hearing often turned into shouting matches between lawmakers, while Clinton looked on bored or amused. It looked like an hours’ long heavyweight sparring match. Republicans used their time to portray the former secretary of state as inattentive to the needs of US Ambassador to Libya Chris Stevens and the American consulate in Benghazi in the days and months leading up to the terrorist attack in which Stevens and three other Americans were killed on September 11, 2012. 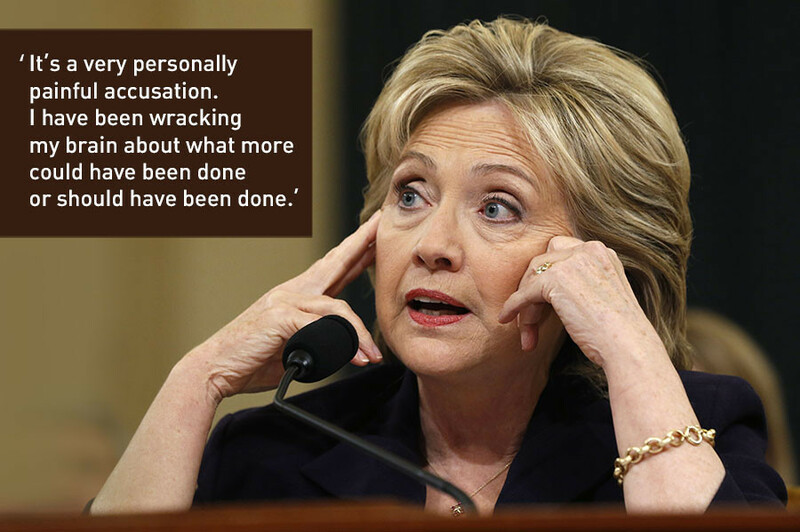 Clinton reacted quickly to all blows, often shifting the blame to others. 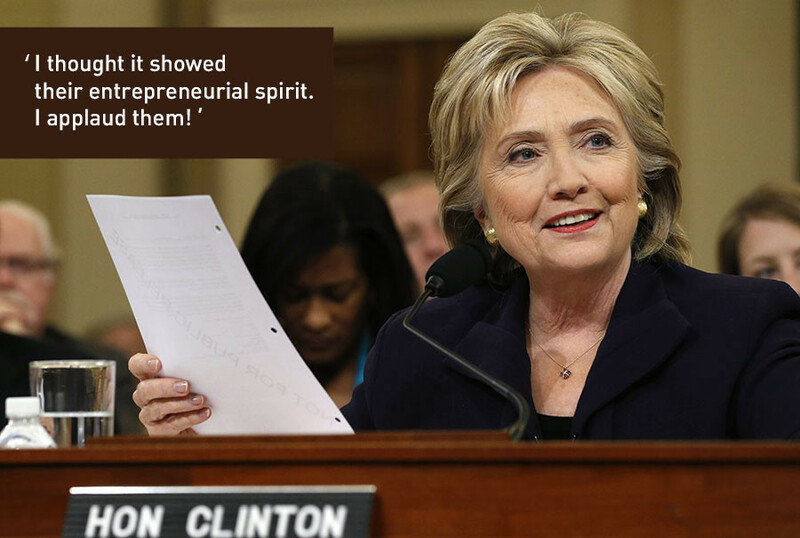 While Clinton, the frontrunner for the Democratic presidential nomination, took pains to keep politics out of the eight-hour-plus hearing, she couldn’t resist making a veiled campaign pitch during her opening statement. The former secretary of state displayed a range of emotions during the hearing. She bickered with Representative Lynn Westmoreland (R-Georgia), whom she accused of belittling the diplomatic security corps. “When you say security professionals ‒ I’m not trying to be disparaging with anybody, but I ‒ I don’t know who those folks were, but…” Westmoreland began. Clinton then jumped in to defend them. “I have to add, Congressman, the diplomatic security professionals are among the best in the world,” she said angrily. “I trusted them with my life. You trust them with yours when you’re [out of the country],” she continued. 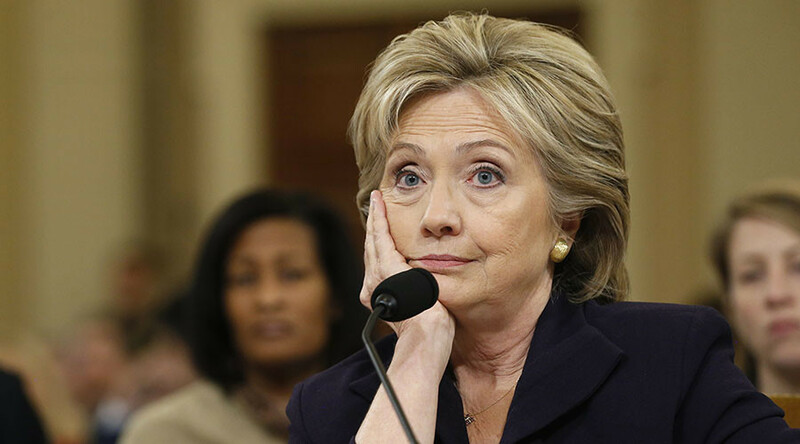 She described how distressed she had been following the Benghazi attack and during investigation. When Representative Susan Brooks (R-Indiana) asked Clinton about an email from Stevens from December 2011 that brought up security at the Benghazi compound, the former secretary of state said he had probably been joking. “One of the great attributes that Chris Stevens had was a really good sense of humor and I just see him smiling as he’s typing this because it’s clearly in response to the e-mail down below talking about picking up a few ‘fire sale items from the Brits,’" referring to security barricades the British were no longer using because they had shut down their consulate in the city. When Republicans tried to blame the former secretary of state for getting the US involved in Libya in the first place, Clinton shifted the blame up the chain of command… all the way to President Barack Obama. “At the end of the day, this was the president’s decision. And all of us fed in our views,” she told Roskam, saying she had done her due diligence before making a recommendation to intervene militarily to topple the regime of Libyan President Muammar Gaddafi. 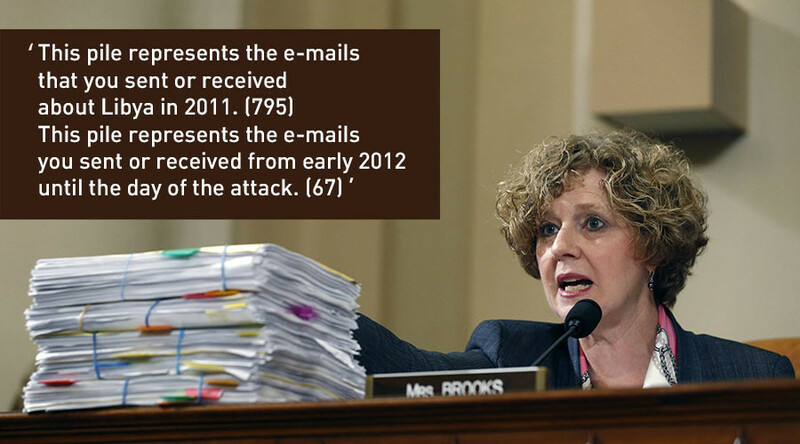 Brooks confronted Clinton as to why “there’s not a single email in your records” about an attack on the Benghazi compound in April 2012. The former secretary also had a testy exchange with Representative Martha Roby (R-Alabama) over security at the consulate, with Clinton defending the lack of measures taken to defend the compound after several requests for help from Stevens. Need to check your notes? 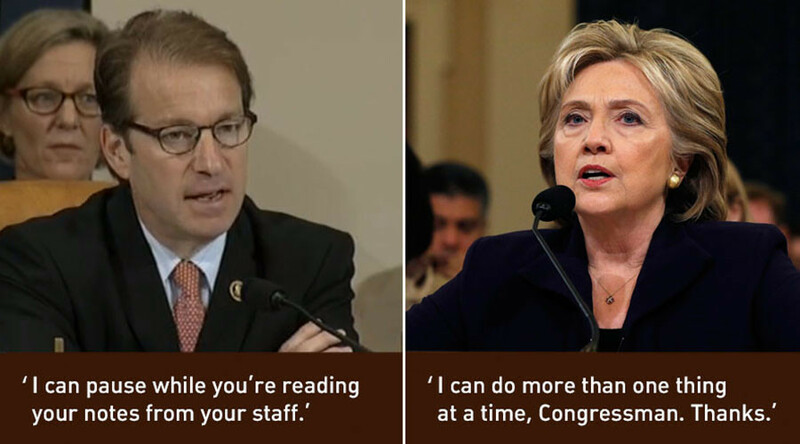 During his remarks, Representative Peter Roskam (R-Illinois) paused twice, his tone dripping with condescension, to suggest that Clinton check her notes. She chuckled as she demurred. Clinton was continuously peppered with questions about her emails, which were sent from a personal rather than government address and were stored on a private server. 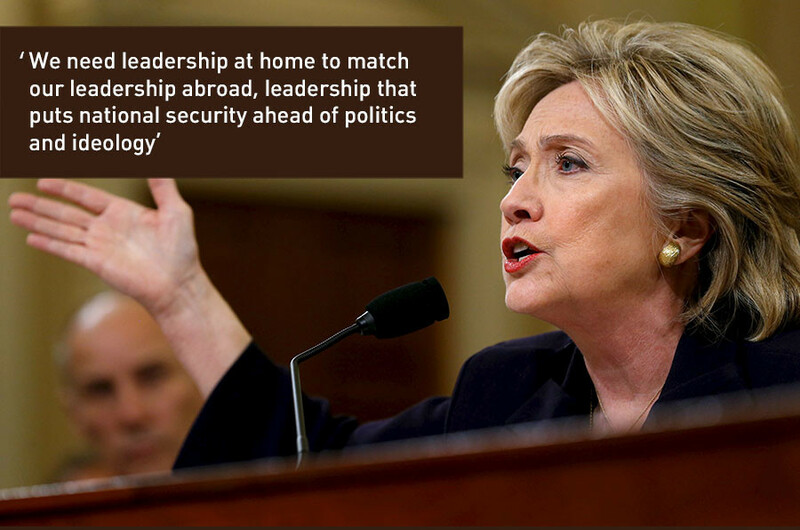 In particular, she was grilled regarding her exchanges with Sidney Blumenthal, a close friend and quasi-advisor. The email issue led to a row between Gowdy on one side and Democratic Representatives Elijah Cummings (D-Maryland), the committee’s ranking member, and Adam Smith (D-Washington) on the other, when the two men asked the chairman to release the transcripts of the committee’s private interview with Blumenthal. “I don’t care if he sent it by Morse code, carrier pigeon, smoke signals. The fact that he happened to send it by email is irrelevant!” Gowdy exclaimed at one point during the seven-minute shouting match in which Clinton did not say a word. Gowdy refused to release the transcripts, saying: “I’m not going to release one transcript of someone who knows nothing about Libya by his own admission while people who risk their lives ‒ you have no interest in their story getting out. You don’t want the ‒ you don’t want the 18 D.S. agents, you don’t want the CIA agents." “The only transcripts you want released are Ms. [Cheryl] Mills’ and Sidney Blumenthal’s,” he continued as Clinton looked on, seeming alternatively bemused, bored, and angered by the argument that ended the first part of the hearing.